Do you ever shop for fabrics online? What about shopping for knit and stretch fabrics? Are you confident in where and how to shop for knit fabrics online, and how to make sure you are using the right kind of fabric for your project? I came to sewing only recently so naturally when I wanted to sew clothes, I wanted to emulate the types of clothes already in my wardrobe, and these days most of them are stretch in some way or another. I think some of that has to do with the expanding nature of my body in the last couple of years – I've found a stretch garment will fit me over more size changes than a regular woven garment. Many of the sewing patterns I've developed have been for stretch fabrics, but I still sometimes struggle to get the right fabric, because I have to order them online and get them shipped in, so I tend to stick with the couple that I know. Cotton jersey and ITY knit. Great. But there are so many other kinds of stretch fabrics and I wanted to expand my knowledge. I've also had quite a few questions recently from people wanting to know if (for example) a ponte knit would be suitable for this dress, or these pants etc. Er, I really don't know – I've never seen or held a ponte knit in real life so I couldn't say. Makes me feel like a sewing dunce that I can't help and am afraid of fabrics I don't know! I know your frustration with buying fabrics online and wanted to come up with a solution for me – and all of you too. Introducing the Knit Swatch Solution! I get a lot of my knits from Fabric Mart – they have a great range and even greater prices. So when I had a question about the different types of stretch fabrics and what was best for what project, they had the answer for me. Here it is – a sample pack of 12 different types of the mostly commonly used stretch fabrics, so now you and I will all know what a fabric looks like, feels like, drapes like, what its made from and what project its suitable for. The swatch kit includes the 12 pieces of stretch fabric and a really good explanation of each one. If like me, you have ever not known what fabric to order, or have (even worse), ordered something and then it just wasn't right and your money was wasted – then you should get this kit. I bargained hard with Fabric Mart on our behalf and this is a great price. You can buy the swatches and the explanatory list for just $4.95 including postage. Think of the money you'll actually save by not buying the wrong fabrics in future. 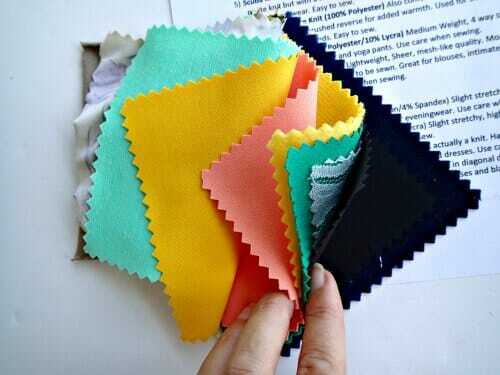 Or even better – if you place an order for $50 of fabric from Fabric Mart, then they will send you the Swatch Kit for free – just add the Swatch Kit to your order then apply discount code SWATCH at check out to see the cost of the kit disappear, and they will include it for free with your order. Sadly these kits can only be sent to the USA. If you are in the UK, there is a great book you can buy as an alternative that includes swatches and information, although it is more expensive. I'm so glad I got mine. It's opened up a whole new world of fabrics I would never have ordered before and I'll be keeping this on hand with my patterns ready for the next time I have to place an order. So what about you? Are there any other fabrics out there that you simply don't order because you don't know what they are? What about the knit fabrics and this swatch kit – what do you think? Would you like to see more like this sort of thing in future? A less lofty question I have in regard to proper knot. I made a sleepshirt, t-shirt style of a cotton knit. It’s so warm and cozy in the winter but can’t wear in bed as it is too warm for sleeping. Can you suggest a knit I should look to for a lighter sleepshirt? Thank you for your articles. I like bamboo and rayon knit, it is super light and soft knit perfect for sleepwear. Basically, these swatch cards are like sample fabrics of different kinds of materials which you could use to have a feel of the fabric of your choice as you’ve stated. 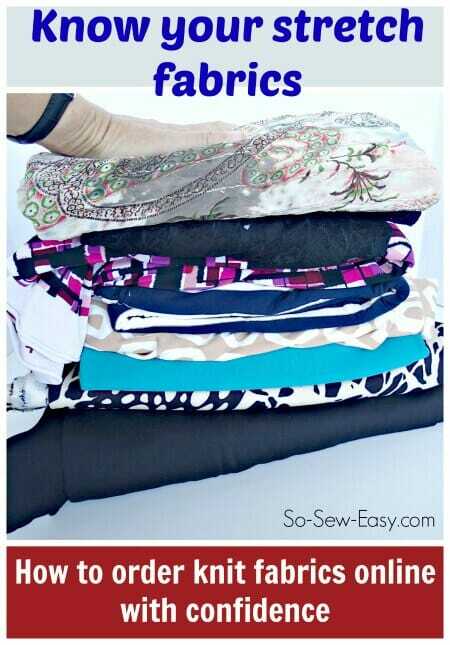 That surely would be helpful especially for people who really enjoy sewing or those who are doing it for a living. Personally, I would need a swatch card if I would ever need something to be sewed as my imagination can’t process fabrics and materials quite easily. Thanks for the helpful information regarding on how to shop for knit fabrics online! I read your wonderful article regarding knit fabrics. I’m trying to wrap my little bitty brain around all of that info. May I ask one question? What kind of knits do you recommend for sewing your flouncy skirt? I’m all ready to cut it out, but I don’t have a clue about which one to choose. I appreciate any help you might have to offer. Thank you for being there. I know I can always count on you to keep so much info for us semi-beginners. You are awesome. HI Cheryl, The best knit for that skirt would be ITY knit as the sample below. Hi Deby, I wanted to get a swatch kit but I don’t see on the website. Is it still available? Hi Jovie, I’ve now taken the links out of the post since these kits are no longer available unfortunately. We had links in a few different posts which were already removed, but I missed this one. Is there any way to get a description of the different types of knits like the one you show above with your swatches? yes this would be useful but it will have to be a long post,I will work on it and link it to this one. Thanks for the suggestion. This video is extremely helpful and I’ve saved it to my favourites! Am excited to make one of your dress patterns and learn more about sewing with knit fabrics. Found some lovely purple knit fabic in the “as is” section for $2/metre at Fabricland and it drapes so beautifully. Bonus is if I make a mistake I haven’t spent much plus if it works I will have a lovely dress! Keep up the great tutorials! Wow this is simply amazing, thank you!!! We do have fabric stores where I live, but the owners and sellers don’t usually take the time to guide you so you have to know exactly what you want! I won’t order the swatches since I’m so far away (Dubai), but I’d be really interested to see similar videos with other fabrics, if you’d consider making more. I’m still quite new to sewing and this video has been so much more helpful than any fabric descriptions or photos I’ve found online. Now I’ve discovered your two sites I’m off to explore your other tips and patterns! Is there a particular named book which you can get in the UK which you’d suggest? For all those interested, I just ordered the knit swatch kit from Fabric Mart. They are available again. They have other fabric swatch kits on their site as well. I am really looking forward to learning more about the different kinds of knits and their best use! Hi Derby, I just love your site but unfortunately here am not able to find knit fabric so I think would go with Knitwits, Australia since they are closer to Papua New Guinea. By the way tried the Chiffon Blouse pattern I did mine with soft cotton fabric, pretty cool. thanks anyway am still following…boge. I have to order most of my fabric in from overseas too. Makes it expensive, but I enjoy sewing too much to let that stop me! Thanks for following along. I am also very interested in the Stretch Swatch Kit for more sewing with knits. I jus sent an email to Fabric Mart to restock. I sent another email to them also. I really don’t like when I see something and then it’s not available. If that’s the case then maybe the post should come down if they are not going to continue or possibly find another supplier who will. Love your website and sewing tutorials. I am a UK resident, and sadly, this offer, and their fabric, is not available this side of the Pond. Do you have any suggestions for good online dress fabrics in the UK? I’m putting together a list of good UK online suppliers now, well, in my spare time. Hope to have it ready by the end of the month Margaret so keep following! I’m also in the UK and would be really interested in your recommendations. Thank you. I was looking for the swatch kit you were talking about in the video and went to the Fabric Mart website and I can’t find it. Do you know if they still have it available? Love your videos! Thanks for making sewing look fun! They are all sold out – twice now. I’ve asked Fabric Mart if they would consider making them up again because there is still a demand. If they agree, I will let everyone know. I think there will be a demand. When I tell others who also want to know about knits. Yes. yes yes. Oh yes, I for one would love one. I just saw that too. I’ve dropped them an email to ask if they would consider making up another batch because it was so popular. I’ll let you know what they say. please do Deb as I just came to find this and this is a tremendous help. I think they need to continue this so we can better shop online. I also will not buy fabric I don’t know what it is or what so, please encourage them as I’m a new follower of yours and want to make the patterns. I received my samples in two days! I love the scuba knit. I think it will quickly become my favorite fabric for dresses! That’s so great! The scuba knit is something I would never have ordered- such a funny name! I keep thinking about shelling out £42.25 for this book with 125 swatches in it: “Fabric for Fashion: The Swatch Book: Second Edition with 125 Sample Fabrics“. Its description makes it sound so useful (see Amazon). I’m really into sewing knits right now, so this would be very handy! Thank you so much. I just ordered mine. I am looking forward to sewing with more knits in 2015! Loved this article. It was very helpful. I’m off to order a swatch kit for myself! Deby, what are your thoughts on how to order stretch fabrics when you need the fabric to stretch a certain percentage, yet the online description does not say how much stretch the fabric has? And, thanks for the swatch pack info–it sounds like it will take some of the guesswork out of ordering online! Most fabric sites won’t give you the stretch percentage, but I’ve found that most knit fabrics in a ‘type’ all have a similar stretch for the most part. Once you know how much a ponte stretches, then all ponte tends to stretch a similar way. Same with jersey, ITY etc. These are times when stretch might be super important such as for costumes, skin tight clothing for ice skating costumes and the like in which case ordering an individual swatch would be the way to go I think, for these specialist fabrics and projects. Thank you Deby. This is one of the most helpful things to come down the road in a long time. Just ordered it – smooth process, so glitches seem to be smoothed out. And YES, emphatically, I’d like to see more articles like this. Thanks for the info, I’ve been struggling with the same thing with knits. I plan on ordering the swatch sample and more. Although I only live an hours drive from the nearest fabric store, it is limited, so I tend to do most of my garment fabric shopping online. Hi Deby, I found this VERY helpful as I would love to order online but hesitate because I am never sure. 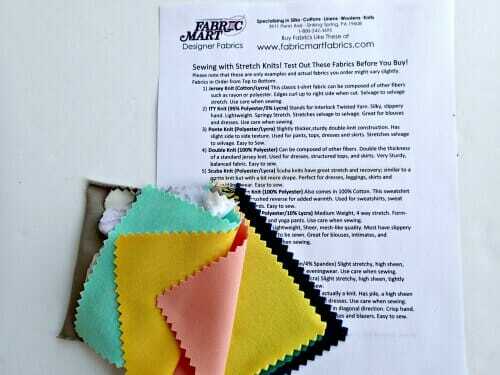 Will check out Fabric Mart and get my stretch swatch kit. I always want to know how fabrics feel. Even a cotton and all the different weaves. If they have swatches for other types of material I would be very interested. I am recovering from two craniotomies right now, can’t sew again yet, but have been collecting patterns and ideas, so watch out I will be sewing again soon. They do have a yearly Swatch club – Julie’s Pick Swatch Club where you get 30 different fabric swatches sent to you each month, plus a $25 off voucher, exclusive special offers, and lots of other benefits. It would make a great fabric reference guide. You can read more about it here. Deby, I am trying to place an order for the swatches, but it wants a coupon code and won’t let me proceed to checkout without putting something in that box. Am I doing something wrong? I just ordered and the shipping was zero, so they may have corrected it. Thanks, Deby this is just what I needed. I was really confused on which knit to order, so this will come in handy. Also, I love your blog and your patterns. Yes, its all now corrected, so if you just order the swatch kit, there is no more postage to pay. If you order fabric too (and I hope you do), then postage will apply to that. Order $50 and use the code to get the swatch kit for free. Thanks for saying kind things about the site Pat. Great to have you following along. This video was helpful. I bought the sewing with knits craftsy course via your blog on black Friday. 2015 is the year I conquer knit fabric cos some of your patterns are so gorgeous but I can’t sew them cos I have no idea where to start with knit fabric. You’ll soon be sewing with confidence Misha! Remember to share what you make – we all love to see your success. Hi Debi, I tried to purchase the swatch kit for $4.95 including shipping but they are charging $8.00 to ship.Is there a code we need to get free shipping? I know – I just noticed that myself because it only went live today, and I just shot them off an email to check. I’ll get back to you as soon as I hear from them, but probably not until Monday. It might be my mistake! No problem. Thank you for your help and your quick reply. This is all now updated so if you add just the swatch kit to your cart, there won’t be any other postage charge. Thanks for letting me know, all now sorted!